Corpus Christi Mobile Confirmation journey begins in the 9th grade and continues to the Sacrament of Confirmation in the 11th grade. "When the time for Pentecost was fulfilled, they were all in one place together. And suddenly there came from the sky a noise like a strong driving wind, and it filled the entire house in which they were. And they were filled with the Holy Spirit, and began to speak in different tongues, as the Spirit enabled them to proclaim. (Act 2:1-4)"
(1) Receiving Religious Education either through McGill-Toolen or our Sunday school program (2) have regularly attended class for at least two years prior to reception of the sacrament; and (3) participate in the immediate preparation including “Spirit Days”, retreats, and service hours. It is expected that the candidates attend Mass weekly. Confirmation Luncheon with the Priest: Sunday, January 21, 2018, 12:00pm-2:00pm, upstairs Conference Room. 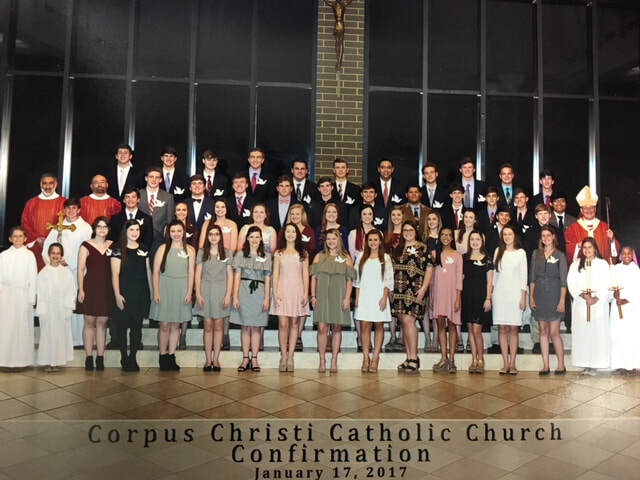 Confirmation Practice: Sunday, January 21, 2018, 2:00-3:00pm, in the church. Candidates and sponsors and/or parents must attend. CONFIRMATION: Tuesday, January 23, 2018 at 6:00pm. Candidates must be there at 4:45pm to meet and greet Archbishop Rodi.